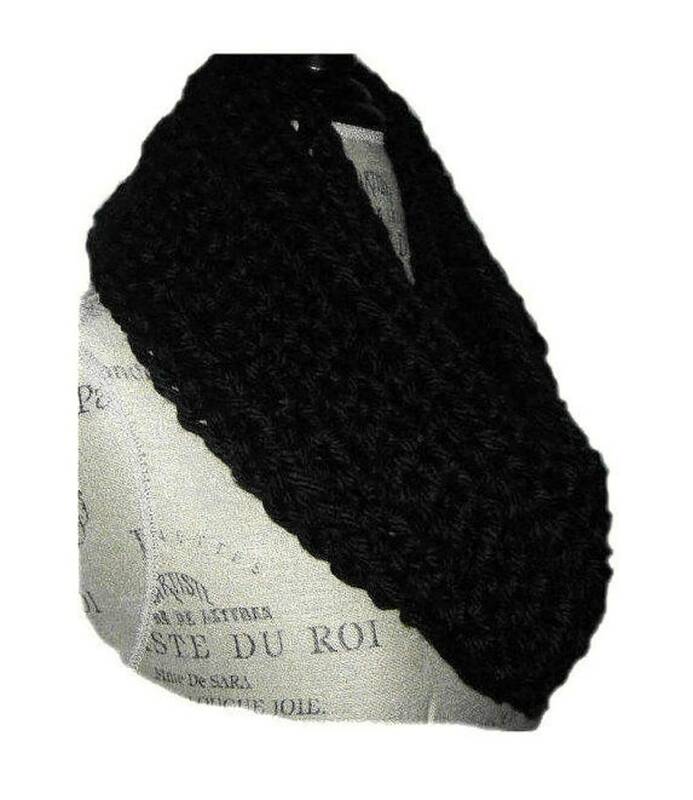 Infinity Scarf Cowl in Classic Black. This scarf's design is our most popular design! It is handmade crochet in a loop in my Exclusive 2 Sisters Handmade Design of soft, loose crochet stitches. The scarf is very soft, warm and comfy. The crochet stitch pattern creates one side that has an interesting pattern of ridges and valleys, while the other has a smoother distinct pattern. There is a slight variation (about 1 inch) in the pattern of stitches where each row is joined together. I consider this area as the "back" which can be worn in the back of the neck and not seen. It's the perfect size at approximately 68 - 70 inches circumference (loop) by 6 inches wide. You can wear this handmade crochet infiniti scarf as a single loop scarf or in two loops to make it a fashion forward chunky cowl, or three loops for an super chunky cowl. It is made with soft bulky yarn that is not the least bit itchy, it's 100% acrylic (vegan). The yarn used for this item is super soft, a classic black color. The scarf will look outstanding with your outfits, jackets, sweaters & coats; and will keep you warm and cozy. Scarf is wrapped & shipped USPS Priority.